President Donald Trump on Wednesday indicated his willingness to create a path to citizenship for the 700,000 young people he put at risk of deportation after ending Obama-era deportation protections. “We’re going to morph into it. It’s going to happen, at some point in the future, over a period of 10 to 12 years,” he told reporters, speaking about so-called Dreamers, the recipients of protections under the Deferred Action for Childhood Arrivals program. “I think it’s a nice thing to have the incentive of after a period of years being able to become a citizen,” he said. Dreamers, undocumented immigrants who were brought to the United States as children, have been living in limbo ever since Trump announced in September that he would suspend DACA. 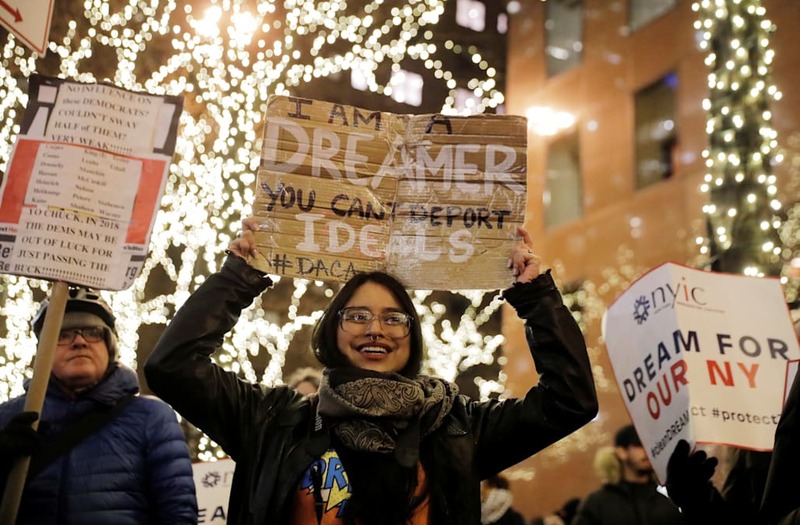 Facing harsh pushback from Democrats in Congress, Trump agreed to give lawmakers six months until March 5 to codify DACA in legislation, after which the majority of Dreamers would start to lose their protected status and be at risk of deportation. Legislative negotiations intensified ahead of last week’s government shutdown, and Democrats ultimately agreed Monday to reopen the government without coming to an agreement with Republicans on the fate of DACA’s funding. Senate Majority Leader Mitch McConnell’s (R-Ky.) said over the weekend that it was his intent to let the Senate bring an immigration bill to the floor next month if a deal on DACA isn’t included in a bill to continue funding the government past Feb. 8. The White House on Wednesday said it would release an immigration framework proposal next Monday of what the president wants to see in any immigration legislation. “This framework will fulfill the four agreed-upon pillars: securing the border and closing legal loopholes; ending extended-family chain migration; cancelling the visa lottery, and providing a permanent solution on DACA,” White House press secretary Sarah Huckabee Sanders said. Sanders declined to answer questions as to whether that framework would include protections for DACA recipients, as Trump appeared to indicate. “Well, if I told you now, it would kind of take away the fun for Monday,” she told a reporter who had asked for clarity during Wednesday’s press briefing. Despite the White House’s insistence on strict immigration changes, many Democrats and DACA advocates have argued for keeping any immediate immigration deal focused only on Dreamer protections and border security measures, and even some Republicans have warned that adding too many unrelated immigration issues could cause negotiations to crumble.